The emergency service speed zone will help protect frontline workers and volunteers from the CFS, MFS, SES, Police and SA Ambulance while they carry out vital emergency work. 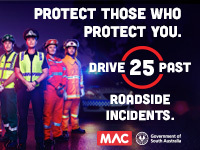 Volunteers and emergency services staff are often called on to provide life saving assistance at roadsides, or it may be that a police officer has pulled over to question a driver. By slowing down, we can all help them to safely get on with their job. Read more about road rules and road rules amendments.